Expert solutions including professional services in engineering and design. We select the right materials, techniques and resources to create lasting solutions that provide quality, beauty and value now and in the future. Institutional, Commercial, Residential surface coating and concrete restoration, in the Greater Montreal area. Thank you for your interest and time, Construction ND was created in 2007 to rise above the minimum standards in the renovation market and in result has many longterm clients who have been with us over several renovations and continue to compliment us with referrals to business associates, friends and family, here’s a few of the reasons why. We are constantly updating techniques and procedures in accordance with the highest standards available. We are committed to creating value in every project or we will not touch it. We value trust and integrity and seek partners and clients who value the same. Our designers, engineers and trades people are committed the best work always. We are concerned about the environment and apply LEAN construction principals to improve efficiency and lower environmental impacts. We use current materials and techniques to ensure highest quality and satisfaction, guaranteed. Whatever your project we look forward to working with you provide quality, value, comfort and satisfaction throughout the process and into the future. Neil has extensive construction experience and is regularly engaged with contractors across Canada to share responsible business practices within the industry. This commitment has been demonstrated in RENO FOCUS sponsored events that are committed to the development of higher standards in building materials . While Neil is no longer on the tools he loves meeting with clients, taking an active role in the project management and occasionally surprising the crew with hands on days during the toughest, dirtiest phases of a project. Neil is a regular contributor to CANADIAN CONTRACTOR MAGAZINE and a supporter of NEXT LEVEL, a contractor group dedicated to upholding the highest practices in the industry. General Contractor serving residential, commercial and industrial renovation projects by providing management, expertise and oversight in the deployment of labor, equipment, support services and materials to complete projects to the highest standards. Implementation of code, specifications, logistics and Lean building principles to provide the highest quality, value and comfort throughout the execution of the project. The President of the company was invited to an invitation only focus group consisting of 24 of Canada’s top General Contractors specializing in renovation to assist in focus discussions with industry manufacturers and producers of construction materials for the purpose of discussing standards, new products and research and development from select industry leaders including: ROXUL, JELD-WEN, Nudura, ITW Construction Products, DMX, Rustoleum and Renovantage. Commercial and industrial projects represent a significant portion of our projects. 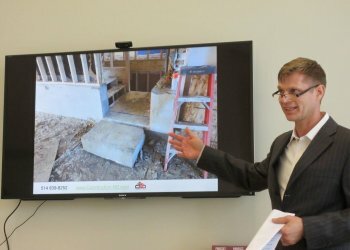 In 2012 Construction ND was invited to bid in a new project based solely on our reputation for integrity in the management of past projects. Subsequent to that invitation Construction ND won bids for the construction of a top producing restaurant location for a global food chain, a national call in center for the territory of Eastern Canadian, territorial maintenance contracts, disaster response projects and general maintenance for locations throughout Quebec. We serve contractors, businesses, start-ups, and developers looking to increase productively without increasing internal overheads. CND, a sought after General Contractor for residential remodels, specializing in custom bathrooms, kitchens and basement remodels. CND is greatly appreciation from clients with exacting expectations for quality and attention to detail as well as difficult custom specifications. In one example CND succeeded in combining the area of an existing water closet and space reclaimed from a demolished chimney to create a full ensuite bathroom with wood cabinetry hand crafted onsite. Today our continued personal approach and unrelenting dedication to quality in the application of the highest standards in materials and building practices continues to make differences for homeowners from bathrooms to home additions and is the foundation of our work today. In 2008 the condemned home of a community member was brought to our attention, with a dedicated workforce and some financial stretching from the homeowners family we gutted everything down to the exterior shell, rebuilt, received compliance certifications from the city and restored the family to their home in about 10 weeks. This need to maximize resources began our application of Lean Construction practices in everything we do and continues to be a driving factor in our ability to be highly competitive and innovative in a market not easily receptive to change. It began with an industry demand for the highest quality workmanship, an unparalleled commitment to value and an uncompromising emphasis on client satisfaction. We are an industry leader and our turn key projects including bathrooms, kitchens, basement remodels, extensions and restoration projects are second to none!